The Friends of S.P. Dinsmoor's Garden of Eden Board of Directors consists of passionate professionals, dedicated to the preservation and respectful promotion of both the Garden of Eden and Miller's Park visionary art environments. Kate Meyer is the assistant curator of works on paper at the Spencer Museum of Art at the University of Kansas in Lawrence. She joined the Board in 2015. Meyer researched art related to the Dust Bowl for her PhD in American Art History and her ongoing research continues to emphasize art of this region. Kate is a Kansas native and enthusiast. Leslie VonHolten is a program coordinator for Graduate Military Programs at the University of Kansas. She has degrees in art history and public administration, with a research focus on cultural program management. She is a founding member of the Percolator artspace in Lawrence and the former director of programs for the Kansas Humanities Council. Leslie joined the Board in 2015. Joy Echer serves as Associate General Council for Foot Locker, Inc., with extensive legal experience as an in-house corporate attorney. She brings her expertise to the Board in matters involving privacy, social media, and multi-channel marketing. As the Creative Director of Design at DEG, Kelly Ludwig brings design-thinking to every facet of the organization and to the Garden. She is mainstay in the Kansas City design community, as the President of AIGA-KC. She is obsessed with photographically documenting visionary environments across the country, particularly the Midwest. Chorale in Hays, and is a regular at karaoke night in Lucas. 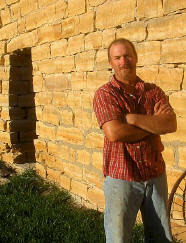 As the CEO of Bluestem Quarry and Stoneworks, Jon Pancost’s objectives are to provide appropriate planning, material and craftsmanship for clients interested in an archaic yet poignant building trade based in quality and foresight utilizing a blend of the best of modern materials combined with the highest quality of old methods and material. Lynn Schneider serves as the Garden of Eden's site manager, caretaking the Garden of Eden and Miller’s Park sculpture environments and managing all day-to-day aspects of these two cultural resources. She's been with the Garden of Eden since 1995. Erika Nelson serves as the Garden of Eden's Cultural Services Director. She was one of the founding members of the current Friends of S.P. Dinsmoor’s Garden of Eden non-profit, and served on the board from its inception until 2018. A native of Lucas, born on the family farm 3 miles south of the Garden of Eden, Doug is a graduate of Lucas High School's class of 1963. He is the former President and Secretary of Lions Club; former President of Chamber of Commerce; Worshipful Master of Blue Hill Masonic Lodge in Lucas (closed in 2015); former first President and board member of Lucas Arts & Humanities Council, Inc.; former first Secretary and now President of Lucas Medical Foundation since 1976. He served the Friends board from its inception until his passing in 2018. John Hachmeister is an Associate Professor of Sculpture at the University of Kansas. John joined the Board in 2011, after being a part of former Garden of Eden Inc., an entity formed to caretake the Garden from 1989 through 2010. John’s tenure on the board ended in 2018, although he remains involved as a holder of knowledge.